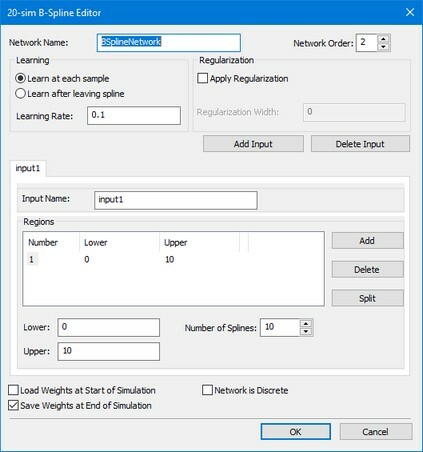 The B-Spline Editor can be used to define a 20-sim B-Spline network. The editor is opened when you try to edit this submodel (using the Go Down command). • Network Name: this is the local name of the submodel representing the B-Spline network (this option is not yet supported). • Order: Enter the order of the B-Splines that must be used. • Learn after leaving Spline: Select this option if you want the network to adapt the weights only leaving the spline region. • Apply Regularization: This option is not yet supported. • Save Weights at End of Simulation: Select this option, if you want to store the weights on file. After each simulation run, you will be asked to enter the filename of this weights file. The tabs shown in the editor is used to specify the inputs of the network. Each tab shows the specific settings of that input. • Add Input: Add a new input to the network. A new tab will be added with default settings. • Delete Input: Delete the input defined in the selected tab (the tab that is in front). Each input is associated with a certain number of splines. To give the user more flexibility, each input can be divided in certain regions that each have their own density of splines. • Add: Add a new region of splines. • Delete: Delete the selected region of splines. • Split: Split the selected region into two regions. • Upper / Lower: The upper and lower bound of a region. • Number of Splines: The number of splines. The more splines you choose, the more accurate will the network output be, for this region of inputs.